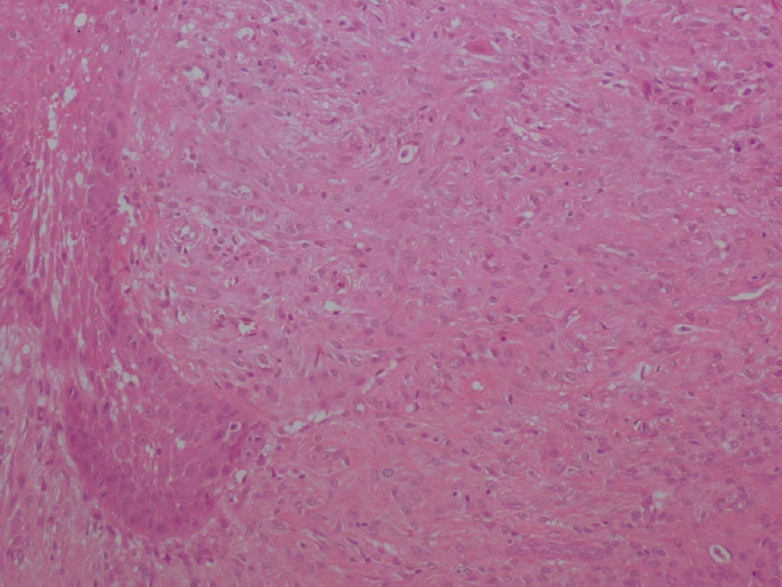 The pyogenic granuloma (PG) is an exuberant tissue response to local irritation or trauma. The young lesions are highly vascular, red or reddish purple, often elevated and ulcerated, and bleed easily. Older lesions tend to be more collagenized and pink in appearance. Despite the name, no pyogenic material or pus is found in the lesion. Treatment protocol of PG includes many options. However, surgical excision is the treatment of choice. Several others highlighted the extremely varied recurrence rates. This case report aims to present 3-year follow-up management of mucogingival defect following surgical excision of PG. The pyogenic granuloma (PG) is one of the reactive lesions of the gingiva. This term was introduced for the first time by Hartzell in 1904. Nowadays, it is considered as a misnomer because the lesion is unrelated to infection, does not contain pus, and is not strictly speaking a granuloma. Indeed, this common tumor-like benign lesion of the oral tissues is, actually, considered to be reactive and traumatic rather than neoplastic in nature., Moreover, trauma or local irritants have been known to be predisposing factors. PG is the most prevalent gingival overgrowth lesion. It can occur at all ages. In addition, females are twice more frequently affected than males. Treatment protocol of PG includes many options. However, surgical excision is the treatment of choice. Several others highlighted the extremely varied recurrence rates. This explains the need of a wide excision whose margins should reach healthy tissue. Such approach can lead to anesthetic root exposure.,, Several surgical techniques have been proposed to manage such mucogingival defects at the time of excisional biopsy. The aim of this paper is to present 3-year follow-up management of mucogingival defect following surgical excision of PG. A 26-year-old systemically healthy female was referred to the Department of Periodontology of the Faculty of Dental Medicine of Monastir (Tunisia), with a painless gingival enlargement at the papilla between teeth 21 and 22 causing discomfort. The patient stated that gingival overgrowth had begun 4 months ago with an increasing separation of the contact between the teeth. The clinical examination revealed a firm pedunculated gingival lesion which presenting an ulcerated surface [Figure 1]a and [Figure 1]b. First of all, treatment protocol includes a conventional nonsurgical therapy with full mouth scaling. In addition, the patient was advised to perform and maintain her oral hygiene by brushing 3 times a day and to use a chlorhexidine mouth rinse of 0.2% twice daily. At the second appointment, 2 weeks later, we observed that there was a slight reduction in the overgrowth [Figure 2]. 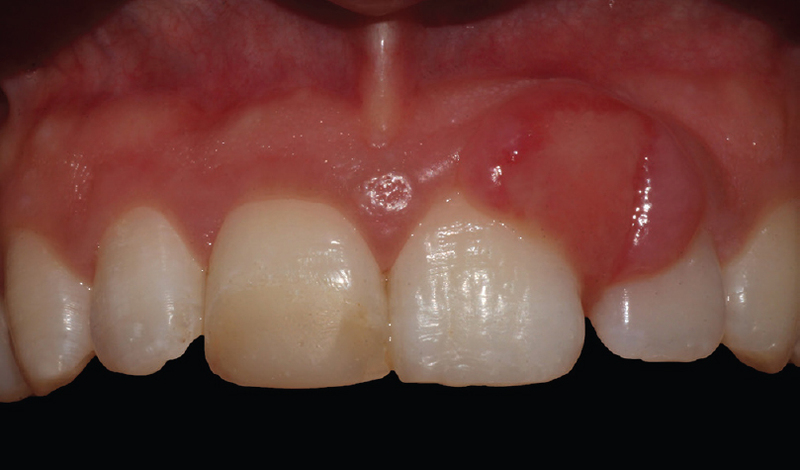 Despite the fact that the lesion regressed, nonsurgical therapy was insufficient to lead to the complete regression of this reactive gingival lesion. Regarding these conditions, we decided to perform surgical management with a wide excision of the gingival enlargement to remove the lesion, the entire papilla, and underlying attachment to the crestal bone. However, the excision of the lesion resulted in a partially root exposure of teeth 21 and 22 associated with the loss of the papilla between the two teeth. Therefore, a coronally advanced flap (CAF) without realizing incision was performed to recreate an interproximal papilla of normal tissue. The flap was raised in a full-thickness manner to provide that portion of the flap critical for root coverage and papilla reconstruction with more thickness. A sharp and wide dissection beyond the vestibular lining mucosa was, then, carried out to eliminate muscle tensions and to provide an adequate coronal displacement of the gingival tissue. The flap was, finally, maintained in a coronal position with suspended sutures around the contact point; and a periodontal dressing was applied to prevent the wound from trauma [Figure 3]a,[Figure 3]b,[Figure 3]c,[Figure 3]d. Following surgical operation, amoxicillin 1 × 2 for 7 days, paracetamol 2 × 3 for 5 days, and chlorhexidine oral rinse 1 × 2 for 10 days were prescribed. The tissue specimen was fixed in formalin and sent for pathological investigation. Histopathological examination revealed a squamous mucosa whose epithelium was per place ulcerated. The chorion assumed the appearance of a granulation tissue rich in capillary type vessels and spindle-shaped cells such as fibroblast like, which were consistent with PG [Figure 4]. By the end of 8-month follow-up, complete root coverage was achieved, papilla was completely filled in the interdental area, and gingival contour was harmonious [Figure 5]a. It must be stressed that no sign of a relapse was noted, even 3 years postoperatively [Figure 5]b. The etiology of PG is unclear. It is not a neoplasm but rather seems to be a reactive lesion caused by trauma or mechanical irritations. In this case, calculus and dental plaque should probably explain the development of such lesion. 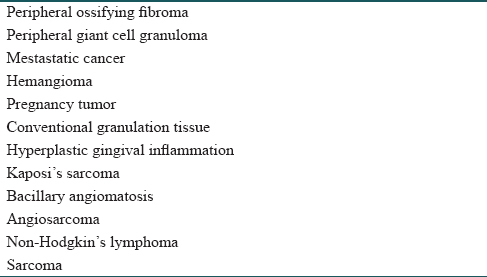 Clinical features of PG allow to confusion with many other soft tissue reactive lesions  [Table 1]. Thus, only histological examinations are definitive in establishing the right diagnosis. Indeed, in our case, histopathological findings were consistent with the diagnosis of PG. However, periodontist should keep in mind that an inadequate surgical resection is one of the most important predisposing factors for relapse; especially that the recurrence rates of this gingival lesion are extremely varied in the related literature. This explains the need of a wide excision whose margins should be completely located in healthy tissue. In our case, no recurrence occurred through 3-year follow-up. However, such radical approach has disadvantages. Indeed, it can lead to gingival defects with anesthetic root exposure, especially when the lesion is in the anterior zone.,, From this point of view, several surgical techniques have been proposed to correct mucogingival defects. Overall, all treatments were effective in reducing gingival recessions with a concomitant improvement in attachment levels. In this case study, as expected, the excision of the lesion resulted in mucogingival defect with loss of the papilla between teeth 21 and 22. To manage this defect, a CAF without realizing incision was performed. In fact, the CAF is the first choice when there is adequate keratinized tissue apically to the defect. Moreover, this technique leads to better results in terms of root coverage than laterally positioned flap and free gingival graft (FGG). In addition, esthetic outcomes are better with CAF than with FGG. Furthermore, the postoperative course is less troublesome since donor sites far from the mucogingival defect are not involved, and healing will occur by first intention. Besides, we avoided vertical releasing incisions because they might damage the blood supply to the flap and result in unesthetic visible white scars. The gingival margin (GM) was placed coronal to the cementoenamel junction to enhance root coverage and interdental papilla recreation. In fact, the greater postoperative coronal displacement of the GM may cause greater root coverage. Indeed, in our case, 3 year, postoperatively, complete root coverage was achieved, papilla was completely filled, and gingival contour was harmonious. PG needs to be diagnosed early. Adequate excision is essential for minimizing the risk of a relapse. Moreover, histological evaluation is obligatory to confirm the diagnosis. This case demonstrated that the immediate esthetic rehabilitation with a CAF without realizing incision is an effective procedure in the management of mucogingival defects after total excision of PG. Rossmann JA. Reactive lesions of the gingiva: Diagnosis and treatment options. Open Pathol J 2011;5:23-32. Regezi JA, Sciubba JJ, Jordan RC. Oral Pathology: Clinical Considerations. 4th ed. Philadelphia: WB Saunders; 2003. Joda T. Esthetic management of mucogingival defects after total excision in a case of pyogenic granuloma. Eur J Esthet Dent 2012;7:110-9. Kfir Y, Buchner A, Hansen LS. Reactive lesions of the gingiva. A clinicopathological study of 741 cases. J Periodontol 1980;51:655-61. Xie YF, Shu R, Qian JL, Lin ZK, Romanos GE. Esthetic management of mucogingival defects after excision of epulis using laterally positioned flaps. Cell Biochem Biophys 2015;71:1005-10. Vilmann A, Vilmann P, Vilmann H. Pyogenic granuloma: Evaluation of oral conditions. Br J Oral Maxillofac Surg 1986;24:376-82. Neville BW, Damm DD, Chi AC, Allen CM. Oral and Maxillofacial Pathology. Philadelphia: Elsevier Health Sciences; 2015. Angelopoulos AP. Pyogenic granuloma of the oral cavity: Statistical analysis of its clinical features. J Oral Surg 1971;29:840-7. Schneider LC, Weisinger E. The true gingival fibroma. An analysis of 129 fibrous gingival lesions. J Periodontol 1978;49:423-4. Buchner A, Ficarra G, Hansen LS. Peripheral odontogenic fibroma. Oral Surg Oral Med Oral Pathol 1987;64:432-8. Bouchard P. Plaque induced gingivitis. In: Parodontologie and Dentisterie Implantaire: Médecine Parodontale. Vol. 1. France: Lavoisier Médecine; 2015. p. 82-91. 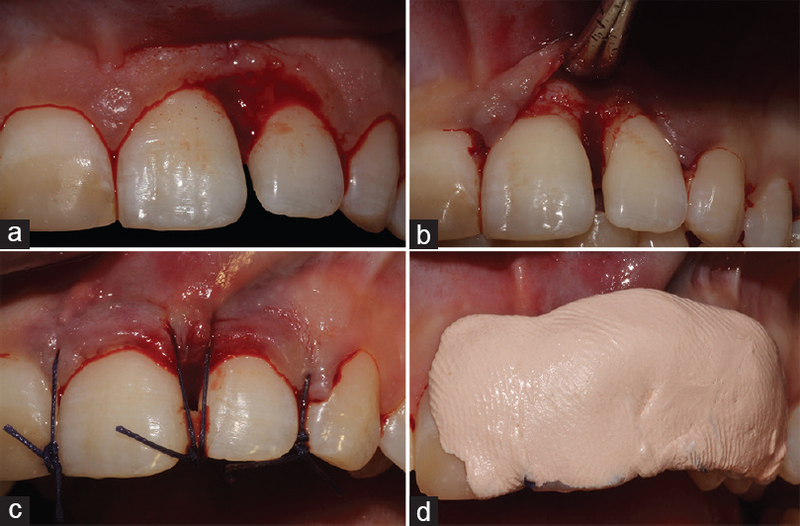 Zucchelli G, Mele M, Mazzotti C, Marzadori M, Montebugnoli L, De Sanctis M. Coronally advanced flap with and without vertical releasing incisions for the treatment of multiple gingival recessions: A comparative controlled randomized clinical trial. J Periodontol 2009;80:1083-94. Borghetti A, Monnet-Corti V. Chirurgie Plastique Parodontale. 2nd ed. France: CDP; 2008. Zucchelli G, Cesari C, Amore C, Montebugnoli L, De Sanctis M. Laterally moved, coronally advanced flap: A modified surgical approach for isolated recession-type defects. J Periodontol 2004;75:1734-41. Zucchelli G, Amore C, Sforza NM, Montebugnoli L, De Sanctis M. Bilaminar techniques for the treatment of recession-type defects. A comparative clinical study. J Clin Periodontol 2003;30:862-70.